A necropsy report issued by SeaWorld in San Diego confirms that Bjossa, the former Vancouver Aquarium orca moved to San Diego toward the end of her life, died of broncopneumonia, an inflammation of the lungs. David Huff, consulting veterinarian for the aquarium, said the necropsy, done by a SeaWorld veterinarian reported that "exactly what we thought was happening [to Bjossa] was happening." He said when cetaceans (whales and dolphins) develop respiratory infections, as Bjossa had done, their bodies often respond by building walls of scar tissue around the infected area. Unfortunately, said Huff, this makes it difficult to treat the infected area with antibiotics. That's why, he said, the course of antibiotics Bjossa received both in Vancouver and San Diego didn't save her. "She'd get better, but then she'd get worse, and in the end, we couldn't help her." Bjossa has been suffering from a chronic respiratory ailment during her last days in Vancouver. After seemingly adjusting to life in California, she had what Tucker termed "a near-death experience" Aug. 20 but survived. Then this weekend SeaWorld staff noticed a change in Bjossa's behaviour. "She became more lethargic," said Tucker. An autopsy was carried out last night but Tucker said the results won't be available for several weeks. Vancouver Aquarium spokeswoman Angela Nielsen sent out a short press release on the death yesterday. A press conference is planned for today. "We're obviously deeply saddened by the news," said Nielsen. But the news was what the Coalition For No Whales In Captivity had predicted. Longtime Coalition spokeswoman Annelise Sorg was too overcome with emotion to speak to the media. But Doug Imbeau, another Coalition spokesman, blasted the aquarium for its treatment of Bjossa. "The Coalition and Annelise have said for quite some time that the aquarium was pawning Bjossa off on SeaWorld," said Imbeau. "A Shamu never dies, is what happens in San Diego," he said. "We've cut at least 50 years out of her life expectancy by stuffing her in a bathtub." BJOSSA IS "GRAVELY ILL" IN SAN DIEGO! Note Bjossa is a 23-year-old female orca dying at Sea World from infections against which she presents little or no defenses. She was moved from Vancouver Aquarium in April this year because it was impossible to purchase a companion for her despite three years searching. Bjossa had a good appetite on her arrival at Sea World but that has changed. She has stopped eating and her trainers are alarmed. Bjossa, Vancouver's favourite killer whale, is "gravely ill" and has not been responding to treatment for a recurrent lung infection, a spokesman for San Diego's SeaWorld said Tuesday. Bob Tucker said the prognosis is "not good" for the 25-year-old orca, despite round-the-clock medical care and visits from her former trainer, Brian Sheehan, who worked with her when she performed at the Vancouver Aquarium. "She's hung on pretty well, but in the last few days things have not been looking good. She hasn't been eating and has displayed listless behaviour," said Tucker, adding that the whale normally consumes about 45 kilograms of fish each day. SeaWorld veterinarians will keep a constant watch on their new addition and are trying to stay positive. "We're just hoping for the best, and we're not giving up by any means," Tucker said. Bjossa lived at the Vancouver Aquarium from 1980 until earlier this year. Left without the company of other whales when her partner, Finna, died in 1997, she was transferred in April to SeaWorld because a companion could not be found for her here. But the move from Vancouver had nothing to do with the flare-up of what amounts to a chronic condition, Tucker said. "She just really blew everyone away with her rapid social adjustment to her new surroundings, but she just never came out of this illness, so medically, her health has always been a concern and never saw any improvement." Tuesday morning, SeaWorld veterinarians transferred Bjossa from a public pool to a private, intensive-care pool in the back of the aquarium. "That was an indication of how concerned the veterinarians here are about her condition. They want to be in an area where they can closely monitor her and access her quickly if they have to," Tucker said. Bjossa became ill last week, when Tucker said she stopped responding to her trainers, lost her appetite and spent more time swimming near the pool's surface. Bjossa weighs about 2,500 kg, and her sheer size makes it difficult to determine what is causing the infection, said Clint Wright, vice-president of operations for the Vancouver Aquarium. "It's very difficult to even pinpoint exactly what's going on inside her. Something like an ultrasound, in a person, you can get a good look at the lungs, but with a whale, because their lungs are so huge and their body is so immense, it's extremely difficult to get a good picture. It's really a bit of a guessing game." Bjossa fell ill with the lung infection in March 2000, but seemed to recover. This time, the problem is lasting longer and seems less responsive to treatment, Wright said. Sheehan and Wright travelled to San Diego last week when they first heard Bjossa was ill, but saw her health take a quick upswing. Confident she would recover, Wright said he returned to Vancouver. On Sunday, Bjossa began to get worse, and Wright will return to the tourist park today. Aquarium staff were pleased with her progress in California, Wright said. "She looked like she was having a great time down in San Diego. She seemed to be doing very well. She started putting on weight and we were very happy with the whole thing. It seemed like it was a great decision to move her there." Although he called Bjossa's condition a "blow" to staff of both facilities, Wright agreed the transfer was not responsible. "I really don't believe it has anything to do with the move. She was in good shape to move, and if there was anything associated with the move, it would have showed up early on, but in fact, she did really well." But Annelise Sorg, director of the Coalition for No Whales in Captivity, said she believes that the Vancouver aquarium sent Bjossa to SeaWorld to die. "They really pawned her on SeaWorld in her last months of life," Sorg said. "I think they wanted to avoid the public relations nightmare that the death of Bjossa would cause in Vancouver." Sorg said the whale lost three babies and two mates during her life in Vancouver, then endured a traumatic move and the loss of her companion, a dolphin named Whitewings. "Her life has been a tragedy one after another," Sorg said. 2403 So. North Bluff Rd. Only nine days remain to bid farewell to Bjossa, the killer whale that has lived at the Vancouver Aquarium for 21 years. Bjossa will be flown to SeaWorld San Diego on April 21. The aquarium has fielded dozens of call from people wishing her bon voyage. Cards and letter have been flooding in. One child wrote: "Dear Bjossa, I love you and hope you live a long and happy life. I am going to miss you a lot. Love, your best friend, Thalia." Jessica sent pencil drawings of Bjossa and wrote: "To Bjossa, You are my most favourite animal in the world. I love you." A woman sent a long message that says, in part: "Give Bjossa a hug for me. She made us feel special." Aquarium staff are preparing themselves for a teary farewell. Bjossa's head trainer, Brian Sheehan, who will travel to San Diego with Bjossa, said: "It's going to be a big hole in my life when she is out of it. It's saying goodbye to a special friend." Aquarium executive director John Nightingale said: "I don't think anyone in the building won't miss her. I've heard so many stories from parents about their kids and Bjossa." The aquarium announced an end to its killer whale display last year after an unsuccessful search for a companion for Bjossa. The 23-year-old whale has been the lone killer whale in Vancouver since the death of Finna in 1997. Bjossa was captured in Iceland and brought to Vancouver with Finna in 1980. The operation to move the 2,500-kilogram whale began last spring with Sea World applying for an import permit through the US National Marine Fisheries Service. The permit was issued last month and allows Bjossa to be moved any time before next March 31. SeaWorld has reserved a Hercules cargo plane for the trip. A crane will be used to lift Bjossa from her pool and into a SeaWorld-designed transport crate. Once in the water-filled crate, Bjossa will be trucked to the airport. The move will take about eight hours, from the moment she is lifted from her Vancouver pool to her release at SeaWorld. Clint Wright, the Vancouver Aquarium's vice-president of operations, said although plans are in place the move could be postponed at the last minute. "If for any reason Bjossa is not fit to travel then she won't go." Wright said, "if there's any problems with the equipment, we won't be able to move her." Bjossa, who currently has the medical clearance to travel, will be re-evaluated by the aquarium's Dr. Dave Huff and a SeaWorld veterinarian the day before the move. For any reason that she's not fit to travel they could pull the plug at that point," Wright said. Bjossa has been given to SeaWorld and it will pay for the move which could cost $200,000 US. Bjossa will join eight whales in San Diego. Meanwhile, the aquarium is to meet privately today with the Vancouver Parks Board to discuss plans for redeveloping the whale habitat. Park commissioners will be shown artist drawings of the renovated area that will focus on the wild West Coast. Annelise Sorg, of the Coalition for No Whales In Captivity, said the meeting should be open to the public. "That is public business," Sorg said. "There should be public accountability." A clause preventing the aquarium from bringing in whales or dolphins from the wild is written into its lease with the board. But under the lease the aquarium can bring in cetaceans - whales and dolphins - caught from the wild before Sept. 16, 1996, or that were born in captivity. Today's article by Nicholas Reid titled "Bjossa gains clearance to take up residence at San Diego aquarium" contains several inaccuracies that I would like to point out. 1. The import permit for Bjossa was approved on March 14, 2001, not March 19 as the article states. 2. The Vancouver Aquarium announced that it would send Bjossa to the US on April 27, 2000, not June 2000 - as the article states. 3. Bjossa is the third killer whale to leave the Vancouver Aquarium alive, not the first - as the article states. Two Icelandic killer whales (Vigga and Benkei II) were brought to Vancouver in 1980 and laundered to the US and Japan in 1981. 4. The Vancouver Aquarium did not phase out its "tricks program" in 1991 due to public pressure - as the article states. According to the aquarium's Values and Visions report (1992), it was Hyak, Finna and Bjossa who refused to do tricks and stopped the whale shows in 1991. However, the aquarium returned to whale shows in 1993 and today you can still see Bjossa perform at 11:30 am, 2:00 pm and 4:30 pm. Furthermore, it is truly disappointing that the article only quoted aquarium industries' representatives and did not contain any of the reasons why Bjossa should not be transferred to SeaWorld. I have very bad news. SeaWorld's permit application to import Bjossa into the US was approved last week and the Vancouver Aquarium says it plans to ship Bjossa to San Diego the third or fourth week in April. I'll let you know when a vigil or a rally will be held for Bjossa. For those of you in Vancouver, watch CBC TV News tonight at 6 pm - and please come to the Park Board meeting on Monday, March 26 at 7pm at 2099 Beach Avenue (low brown building at the entrance to Stanley Park). Help send a clear message that Bjossa should not be replaced by new dolphins. Please contact me for more information, or if you would like to speak at Monday night's Park Board meeting. PLEASE WRITE A LETTER TO THE EDITOR! AQUARIUM CONSIDERS CAPTURE OF MORE WILDLIFE! Following below is today's Vancouver Sun front page article on the Aquarium's plans to replace Bjossa with new dolphins and other marine mammals. - Write a letter to the editor *ASAP* opposing the Aquarium's plans! - Make it short and to the point (2-3 paragraphs). - Include your name, address and phone number, no matter what country you live in. Walruses, sea lions, arctic foxes, sea otters and even polar bears are among the animals being considering as replacement exhibits for Bjossa's Stanley Park pool once the orca is moved to San Diego's Sea World later this year. Vancouver Aquarium director John Nightingale said while there are no firm plans for the pool yet, he and his staff have considered using it to display animals either from the Arctic or the West Coast. The Arctic display is much less likely, Nightingale said, and, given its possible inclusion of polar bears, far more controversial. Until its closure as a result of a 1993 plebiscite, the Stanley Park Zoo housed two polar bears. The last one, Tuk, died in 1997 at the age of 36. Nightingale said the Arctic idea is "highly unlikely," but that it was aquarium practice "never to say never." "We kicked around some ideas," he said of the proposal, "but we never drew up a list of the animals it might include." Much more attractive, he said, is the idea of turning Bjossa's pool into an "interactive, customizable, multi-species" display of West Coast marine life, including Pacific white-sided dolphins, Stellar sea lions, harbour seals, fur seals, sea otters, and various sea and shore birds. The aquarium already has one white-sided dolphin, Whitewings, sharing the orca pool, as well as eight Stellar sea lions, three sea otters, and two harbour seals in other pools. But depending on what form the exhibit takes, more animals may be required, and Nightingale doesn't rule out catching them from the wild. "We made an agreement in 1996 that we will not catch any more cetaceans [whales and dolphins] from the wild, and we will honour that," he said. But the agreement does not include any other types of animals. Park board chairwoman Laura McDermid said she was "shocked" to hear that wild animals could be caught for permanent display. "I'm okay with rehabilitating sick or injured animals and returning them to the wild, but if we're talking about capturing wild animals for permanent display, that's something the board certainly needs to look into." Vancouver Humane Society director Debra Probert said she was "astounded that the aquarium would consider replacing Bjossa with other animals." "Growing scientific evidence demonstrates that it is impossible to keep most wild animals in captivity and provide them with any semblance of a normal existence. Live-animal displays at the Vancouver Aquarium are simply a zoo with water." Nightingale disagrees, saying the exhibit he envisions would provide visitors with a link to the real West Coast. "Most visitors to the aquarium will never visit the wilderness. We can provide them with a surrogate experience." By doing that, he says, visitors will come to learn about the environment and cultivate an interest in protecting it. That, says Probert, is a "tired old argument" for justifying keeping wild creatures in captivity. "What does one learn by exploiting animals? The residents of the City of Vancouver spoke in 1993 and made their wishes clear -- no more zoos. "If [the aquarium] wants to do the right thing, the ethical thing, they should set aside all aesthetic considerations and give the space to the Belugas who are desperately in need of more room." Nightingale said none of the plans has been formalized, and that any changes to the pool will take place over a five-to-seven-year period. He wants to consult the park board as well as tourism and conservation groups before he commits the aquarium to anything, because they all have an interest in its future. McDermid agreed that "so far there hasn't been any discussion at the board level about exhibits and exhibit changes." The cost of renovating the pool would depend on what changes will be made to it, Nightingale said, but it could run as high as $20 million. He expects the money will come from corporations, foundations, the government, aquarium revenue and individual donations. Nightingale couldn't give a firm date for Bjossa's departure, saying that it depends on when the U.S. government issues a permit for her transfer (that could happen in February), agreeing on a timetable for that transfer with Sea World, and Bjossa's health, which has been precarious for a number of years. The US government will accept public comments regarding Sea World's application to import Bjossa to San Diego from the Vancouver Aquarium until January 5, 2001.� This is our last chance to help Bjossa - so please take the time and write a letter opposing Sea World's application (send us a copy!). Focus your letter on one or two arguments that you feel are important.�� The more diverse and detailed arguments we can come up with, the better chance Bjossa has of staying in Vancouver and hopefully someday going back to the wild.� Following below are some arguments you can use, but I encourage you to come up with more. If few or no comments are received, Sea World will be granted the import permit in January and Bjossa could go to the US right after that.� Please help Bjossa NOW!� You are her last hope. - Bjossa's not healthy.� The Vancouver Aquarium staff doesn't know what's wrong with her.� She may not survive the trip and if she does, she may infect other dolphins kept at Sea World.� See below - c) Bjossa is not healthy. - It is cruel and inhumane to take Bjossa away from her trainers and her only surviving tank mate "Whitewings", a female Pacific White-sided dolphin.� These are the only people and the only dolphin still alive that she has known since she came to Vancouver 20 years ago.� But then again, there is nothing humane about keeping orcas in captivity. 2. NMFS must determine whether Sea World's proposed activity by itself or in combination with other activities, will not likely have a significant adverse impact on the species or stock, or on any other marine mammals. - Sea World routinely combines and breeds captive orcas coming from different pods and areas of the world.� This "cocktail mix" of genes and cultures creates tension and aggression between some orcas in captivity who have been injured and died. Bjossa is a temperamental whale who will probably have to be kept separate from the other whales. - If Sea World's "mixed" whales (captive-born or not) were ever to be set free in order to replenish wild stocks (as a true conservation program would try to do), there are less chances that they would be recognized and/or accepted by other whales in the wild. Sea World is tinkering with evolution. - There is evidence that the continuing world trade in live orcas has affected wild orca and other dolphin populations (or "stocks"). Off the Pacific North coast, some orca pods may go extinct because of decades of aquarium live-captures. Since there is an increasing number of� dolphinariums popping up around the world, more and more orca and other dolphin populations will be affected by the commercial live-trade. 3. NMFS must determine whether Sea World's expertise, facilities and resources are adequate to accomplish successfully the objectives and activities stated in the application. - Sea World has requested to import Bjossa for the purpose of� breeding and public display.� Breeding Bjossa is something that the Vancouver Aquarium stopped doing 5 years ago because all of her calves have died shortly after birth. 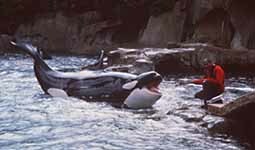 Sea World will try breeding her despite the cruelty involved. See below:� - a) Bjossa is not a "Breeder". - Chances are that Bjossa can not be trained to perform at Sea World's whale shows, which include trainers riding on orcas' backs and children kissing beached orcas' heads.� Bjossa is a temperamental orca who has never swam in a tank with a human and will probably not get along with the other orcas either.� Because of this, chances are that Bjossa will be kept in solitary confinement and only be allowed to interact with a chosen male while she is in heat.� See below: b) Bjossa is not a "Shamu". a) BJOSSA IS NOT A "BREEDER" �Sea World has requested to import Bjossa for the purpose of breeding.� Breeding Bjossa is something that the Vancouver Aquarium stopped doing 5 years ago because all of her calves have died shortly after birth and the public relations nightmare that turned out to be. After the third death in 1995, the aquarium placed her on experimental contraception drugs for a year and a half.� In 1997 they took her off the drugs and in order to avoid future pregnancies, they announced that they would exchange Finna (the male orca) for a female from another dolphinarium. Sea World said that they would be happy to take Finna to use him for breeding purposes.� This meant that Finna would have been� flown from one Sea World facility to the next (4 in total) siring calves with different females. The Vancouver Aquarium staff felt proud that Finna would become Sea World's� "jet-setting stud". But all this didn't happen.� Finna died in Vancouver on October 6, 1997, before the Aquarium was able to send the stud to Sea World. Sea World has a history of abusing "breeders".� Our beloved Corky, a female North Pacific orca captured 32 years ago and still held at Sea World in San Diego, has given birth to seven calves and they have all died. Who knows how many miscarriages and abortions she might have had that we don't know about.� It is obvious that Sea World will continue to breed females such as Corky and Bjossa, regardless of the staff's inability to keep their calves alive.� If Bjossa stays in Vancouver, she won't have to survive another dead baby because she'll never get pregnant again. If Sea World gets her, who knows how many more times she will become pregnant and have survive her own calves. This is criminal. b)� BJOSSA IS NOT ANOTHER "SHAMU"
All orcas at Sea World are called "Shamu" (so that "Shamu" never dies) and they are trained to perform tricks that are not familiar to orcas kept at the Vancouver Aquarium.� Bjossa is not a good performer at best of times in Vancouver. At 23 years old, her trainers will tell you that Bjossa is a cranky old captive whale, a dominant female with a short temper.� Although familiar with her trainers in Vancouver, none of these people would ever dream of jumping into the pool with her, or try to "surf" on her back like they do to the orcas at Sea World.� If she is not able to learn to perform like the new trainers would demand, she will be kept in a tank in the back. �After 3 years of looking for another female orca to bring to Vancouver, the Aquarium has not found one that they thought could get along with Bjossa. If Bjossa is shipped to Sea World and she is aggressive to the other orcas there, she will certainly have to be kept ALONE in a tank in the back.� We all know that this is inhumane but it is regular practice at Sea World. c) BJOSSA IS NOT HEALTHY Question Bjossa's health. Demand to know what is wrong with her health, why she looks so thin and her dorsal fin so wobbly. The truth is that no one knows what's wrong with Bjossa.� According to the Aquarium staff, they have brought in every expert they could find and they still don't know if she has an infection caused by a virus, a bacteria or a fungus.� How can you cure someone if you don't know what's wrong with her?� Why risk her health by transferring her to the warm climate of San Diego, when she comes from the icy waters off Iceland and has lived in the colder weather of Canada for the past 20 years?� Why risk the health of other captive orcas kept at Sea World by having to share the chlorinated water with a sick orca? Bjossa has not been well ever since Finna died in 1997.� First the aquarium staff panicked because they thought that she was pregnant again - and a ton of tests (including ultrasounds) were conducted for months before the staff announced that although they still didn't know what was wrong with her, she definitely was not pregnant.� Of course we'll never know (they'll never tell us) if she had a miscarriage or if she really was not pregnant.� Three years later, the aquarium still can't determine what is really wrong with Bjossa's health. She also shows disturbing neurotic behaviour.� You can often see her desperately chewing at the side of her concrete tank to the point where most of her teeth have been worn down and her gums and rostrum sometimes bleed.� Sometimes she also swims in endless identical circles, breathing and turning in the exact same spot in the tank.� This is called "stereotypical behaviour" and it shows the boredom and stress that these huge animals kept in small sterile tanks must endure.� Similar behaviour is found in land mammals such as captive bears chewing the bars of their cages or captive wolves pacing up and down and up and down in their boredom and desperation to find a way out of the cage. Comments may also be submitted by fax at (301) 71 3-0376, provided the fax is confirmed by hard copy submitted by mail and postmarked no later than January 5, 2001. Please note that comments will not be accepted by e-mail or other electronic media. Please, write a letter for Bjossa!� If you really want to help her, this is your last chance.